Beth Dow‘s photography is unexpectedly cool and non straightforward. Her imagery demands her witnesses to view and look at the work with a slow eye. Tricks, surprises, details abound in her photographs. Tucker Hollingsworth recently interviewed Ms. Dow about her current projects, recent works, and ongoing interests. Dow’s photographs have been exhibited throughout the Midwest, as well in New York, the United Kingdom, Japan and China. She has been the recipient of two Minnesota State Arts Board Fellowships (2008, 2011), a McKnight Foundation Fellowship (2004, 2011), and a Greater London Arts grant (1989). Her work is represented in public collections such as the Minneapolis Institute of Arts and the Portland Art Museum. MPB: You like order and design. Why photograph landscape? BD: I’m actually most interested in acts of rebellion against order and design. That might be why I love formal gardens, especially English ones. We kid ourselves that we can impose artificial structure on living, organic things, and go to great lengths to impose our will. We can only fail, and I love those little gestures of failure. MPB: Do you respond to fields and plains–undeveloped, unused, or left to hazard? BD: I tend to overlook those landscapes in favor of examples of more direct human interference. I’m sure the wilderness is marvelous, but it wouldn’t occur to me to make photographs in such a place. MPB: Are you philosophical at all in terms of contemporary land use/mis-use? BD: I am in other aspects of my life, but not in my photographs. I recognize that we live on, in, and from the land, and that parasitic existence can’t always be pretty. MPB: I just want to understand: Chaos in nature is a form of order. Chaos is visually unorganized. I think there would be quite a number of people who would find fussy, over-the-top gardens to be just a slight step away from chaos. Yet, you see an opportunity to communicate order using horticulture-forms, arranging mass and scale into your compositions. Is your work a conscious reaction to this paradox? BD: I tried to compose my garden photographs in a way that would slow everything down. They sort of feel like held breaths to me. Having said that, I shoot very quickly, and with a hand-held camera. I’m far too impatient for a tripod! Those photographs are about the illusion of stillness, but insects are buzzing, leaves are rustling, and sap is rising. There is movement all around, but on a small, subtle level. And they are also about the illusion of imposed order, but branches break, and shoots sprout. MPB: We both manufacture and observe landscapes. We landscape with our tools and shovels and pickets; we observe and interact with landscape as well. Do you have interest in manufacturing landscapes with your camera? BD: Yes, but that newer work is not on my web site. I’m currently using digital tools to make artificial landscapes that move through time and space. MPB: That would be a new venture for you, as you’ve mostly involved historical processes with your work. What excites you about the change in your work? BD: I’m messing around with the malleability of space and time, and the tensions between fact and fiction. I’m trying to make landscapes that look rational at the first glance, but that are also illogical, and digital editing is an obvious tool for that. My previous work, printed in platinum-palladium by Keith Taylor, uses the labor, process, and rich, unsurpassed tones of the medium as part of the metaphor of the imagery. They are meant to be ageless and permanent. This new work is less about the photograph as object and more about it being a fleeting instant in space and time. MPB: What projects are you working on during your current McKnight fellowship? BD: I’m combining my interests in the history of photography, world history, geography, and books. I’m experimenting and having fun! MPB: You’ve received two McKnight fellowships for photography. Does the first inform your current fellowship? BD: I’m surprised to realize it probably doesn’t. The two projects aren’t related in any way. MPB: Who and what have been your most enduring non-visual influences? BD: Literature, always. I especially like people who say seemingly subtle things that, on further reflection, are rather subversive. MPB: I see your work and I immediately think back to works by Atget. But I understand you respond to Frith–and in a lot of ways that makes sense because your interests to capture exotic locales or unique views seems shared. Are you deeply affected by early photography? BD: Absolutely, but I’m interested in Francis Frith and other Victorian expedition photographers for perhaps the wrong reasons. I’m mostly interested in the ways their process failed, so I love the white, heavily retouched collodion skies behind graphic pyramids and other antiquities, and I also love the titles in their print margins. MPB: Do you feel your photos have any relationship to Atget’s work? BD: I realize it’s logical to mention Atget in regards to my garden photographs, but I was actually thinking about earlier artists, like Claude Lorrain. 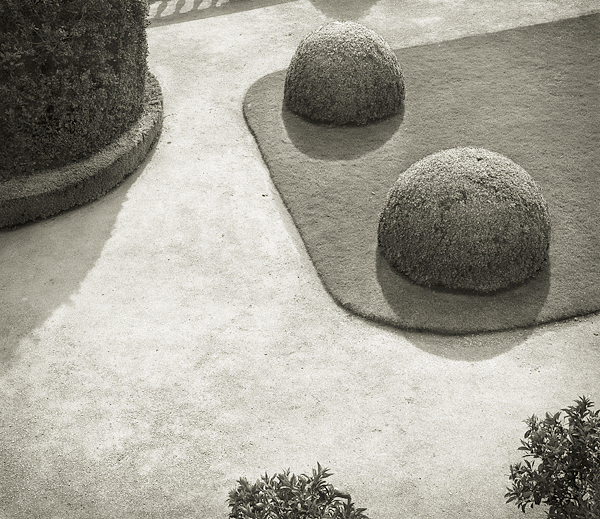 Garden photographs are usually made in color, so I can see how my tonality has something in common with Atget. MPB: Do you feel your photos have any relationship to works by Henri Cartier-Bresson? BD: Most of my early work was shot on the street, and usually included bits of people passing through. I made that work before I knew anything about Cartier-Bresson, but some of my shots look like his! MPB: How do you see your work in relationship to the photographers of yester-year? BD: I use historic processes and visual conventions to tell stories about the contemporary landscape. BD: Why must we fidget with the world? Because it’s there. And where do our efforts get us? Here. MPB: One of my favorite images of yours is “Broken Tree” from Fieldwork. At immediate glance I’m pleased by the structure, and miss the comedy or action of what’s happening or occurred. If you remember the details, could you describe if the break-down was a live-action shot, or if it’s part of a slower deconstructive process? BD: That picture came about in a way that’s unusual for me. It was shot in rural Wisconsin on a road we traveled frequently. A huge wind storm blew apart the weeping willow, and that enormous branch hung there for ages, dangling precariously above the piles of neatly cut fallen branches. I loved that the owners never bothered to just pull that branch down, and finally took a picture after watching it week after week. As I said earlier, my photographs are usually quick, spontaneous responses to things I happen upon. That one festered for months. MPB: I also think about the way I read that image and I realize: It’s allowing the photo to speak to you versus us reading into images. BD: My whole Fieldwork portfolio is a collection of curious sculptural arrangements and forms in marginal rural landscapes. Many of these forms and structures were made for utilitarian reasons, and that was their only meaning. I love finding those little intrusions on the landscape, and especially like to leave the narratives wide-open for speculation. MPB: Another image I enjoy of yours is, “Soccer Game: Bell Field.” The image captures nostalgia, but for me it’s really successful in delineating tension in point of view, trying to see action as it is best happening. When negotiating with the image, I think about where I’d perch myself to see the game, where are the other open spots or other people camped, what’s happening on the field, what’s the geography. Essentially, the photo can be read as a metaphor for how to look and how to interact with space. “Image as space,” I see it more than “image as place.” I see the image more universally than a Carleton College experience. For you, what about that image works, and what do you see in it? BD: I love that people are just scattered all over the place. 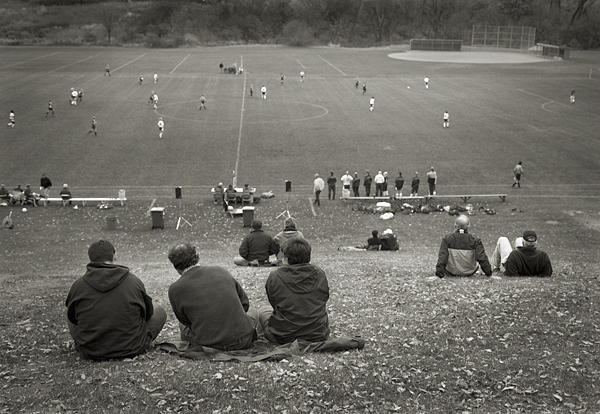 Even though a soccer game is underway, the players are dispersed evenly and show little engagement with each other. Likewise, the spectators are spread randomly on the slope, staring ahead and waiting for something, anything, to happen. The clouds kept opening up, flashing little spotlights on the scene. This photograph has a lot in common with my earlier photographs I spoke about previously.